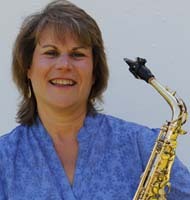 Dr. Gail B. Levinsky is Associate Professor of Music at Susquehanna University where her responsibilities include teaching applied studies in saxophone, chamber music, woodwind methods, and instrumental pedagogy. She has performed on the national and international stages, including at the North American Saxophone Alliance, World Saxophone Congress, National Association of College Wind & Percussion Instructors, British Saxophone Congress, and Music by Women Festival. In addition to her performance schedule Levinsky regularly presents clinics at state music education symposiums, including the Midwest Band & Orchestra Clinic. She has several publications and CD recordings, most recently an arrangement of Tomas Victoria’s “O Vos Omnes” for saxophone ensemble.